Wintry conditions all too often play a role in tragic accidents, and the best advice is to be prepared. The law firm of Edgar Snyder & Associates is offering information on ways you can help prevent accidents and injuries. "If you absolutely must drive," says Attorney Edgar Snyder, "take an extra few minutes to warm up your car and clear off any snow or ice. It's safer, and it'll save you a run-in with traffic laws." Not only is driving with a snow-covered car dangerous, it's also illegal in Pennsylvania. Once you're on the road, it's strongly recommended that you reduce your typical speed and leave room for stopping, braking gently when you do so to avoid sliding. Don't use cruise control, and use a low gear to maintain traction. When driving, also keep in mind that bridges and overpasses freeze first. Deadly accidents can occur as a result of isolated ice patches caused by road defects and poor maintenance. For an isolated ice patch to form, it means that the road isn't draining as it should. It could also mean that there was water on the road that shouldn't have been there to start, like from a sewer or downspout. Unfortunately, with unexpected ice, there's little you can do to prepare in advance. Our biggest recommendations are to always take it slow in freezing conditions, and know what to do in case you hit ice. If you're skidding, stay calm and take your foot off the gas. If your front tires are skidding, shift into neutral and only try to steer once you are slowing down. Once you feel traction, you can put your car back into gear and gently accelerate. If your rear tires are skidding, steer in the direction you want the front wheels to go, and apply pressure to your anti-lock brakes. Don't worry if you feel them pulsing. If you get stuck in the snow, don't spin your wheels—it'll only make it worse. Instead, turn your tires to push snow out, and clear snow from your tires and from under your car. If you have it, pour sand, gravel, or kitty litter in the path of your wheels. Then, put your car into a low gear and use a light touch on the gas to ease your car out. If you have not already, it is time to winterize your car. "Winterizing your car can prevent damage and save you money in the long run," says Attorney Snyder. "If you're not ready for this weather, you're not only putting yourself at risk, but also anyone else on the road." Do a full check-up of your car, looking specifically at: tires, belts and hoses, windshield wipers and fluid, defrosting and heating systems, antifreeze, oil levels, battery, and tire pressures. Make an appointment to get your snow tires put on, and if you don't have them already, consider getting them. In case of an emergency while on the road, it's a good idea to have tools to help you get moving again. It's not a bad idea to gather the following: jumper cables, an inflated spare tire, a wheel lug wrench, a tri-pod jack, salt or cat litter for traction, tow and tire chains, a tool kit, and heavy-duty gloves. Some cars come equipped with some of these tools, so check your car's manual to see what else you may need. In the rare case that you're ever stranded, you'll also want create a car survival kit. It may seem unnecessary, but remember that these items won't ever go bad, and they could save your life. Put together a kit with the following items: a compass, blanket, water bottles, first aid kit, flashlight with extra batteries, reflective triangles and flares, bright cloth, an ice scraper and brush, wooden matches in a water proof container, and non-perishable, high-energy food, like unsalted nuts and dried fruits. If your car is equipped to charge a phone, also include a spare compatible cell phone charger. If you are ever stranded, don't leave your car unless you know where to find help. Light your flares, and tie your bright cloth to your antenna. If you have gas and your exhaust pipe isn't blocked, run the heater for ten minutes every hour. 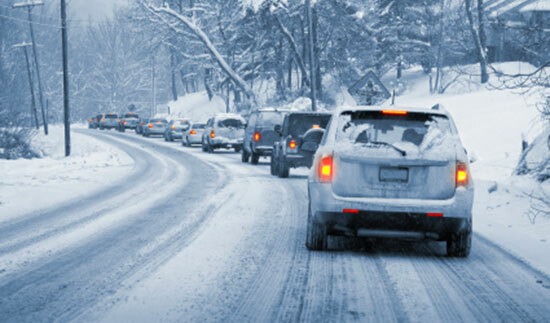 Edgar Snyder & Associates offers many winter driving resources for drivers to stay safe this winter. Visit their website for more season safety information.